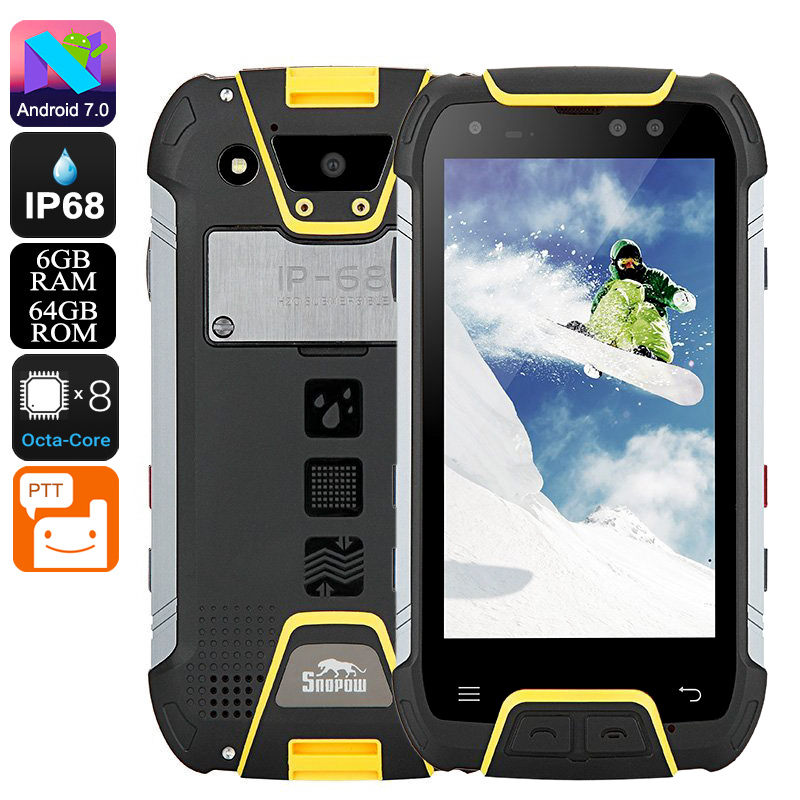 Successfully Added Snopow M10W Rugged Phone - Octa Core CPU, 6GB RAM, IP68, 6500mAh Battery, Dual SIM, 4G, Walkie-Talkie, 5 Inch Screen (Yellow) to your Shopping Cart. Made from a metal frame and with protective rubber coating, the M10W from Snopow is a rugged phone that boasts an IP68 rating. This makes the phone fully waterproof and dustproof. So you can submerge it in up to a meter of water without worrying about any ingress. It's also impervious to dust particles. If you're a keen outdoor adventure or work in tough conditions then this is the phone for you as it can go just about anywhere and operate under the most demanding conditions. You will be able to stay connected to two service providers at once as it has dual SIM slots and IMEI numbers that operate on a wide spectrum of 4G frequencies including B1, B2, B3, B4, B5, B7, B8, B12, B17, B20. If you're off the beaten path and away from regular phone services then the phone's Walkie Talkie function will ensure you can still keep connected to the outside world. This M10W rugged phone has high-powered hardware consisting of an Octa-Core CPU and 6GB of RAM. So you will be able to enjoy the most demanding apps and games without any lag or delays. With 64GB of internal storage and micro SD card options to add a further 128GB of storage, you will have room for a comprehensive lineup of apps, games, and media. GPS navigation support gives you directions in the palm of your hand so you'll never get lost again. The phones massive 6500mAh battery allows you to use the phone for a solid 7 hours or around 5 days in standby. So with the typical usage you can go days without needing to recharge. The phones professional-grade 16MP camera and 8MP camera let you snap beautiful images and 1080p video or your adventures.